This entry was posted in Manson Family and tagged Arroyo High School, Cielo Drive, El Monte, LAPD, Manson Family, Sharon Tate, Steven Parent by Frank Girardot. Bookmark the permalink. We lived two doors away from the Parents on Cypress Dr, which used to be Central Ave in the the 50’s and early sixties from 1954 to 1963. I knew Steven who was three years younger than me but we never played together. I delivered the paper to his house. When returning from a vacation in Arkansas by car, we noticed our garage had been broken into and a clock radio from my Dad’s workbench was missing. I knew Steven was into tearing apart radios and rebuilding them because I did the same thing…except I didn’t go looking for them in other people’s houses. We confronted Steven and his father who went into his room and retrieved our radio, in pieces. He was apologetic and assured us it would be fully reassembled and returned to us. I can’t recall if my Dad called the El Monte police or not, but I do recall Steven coming over to the house and bringing back the radio and giving to my Mom. It worked!! I always thought that whole episode was bizarre and we moved away shortly after that. It was while I was in college I heard about the killings and was shocked to see Steven’s name among the victims. I felt really bad since even though he stole from us, I felt he was a good kid. My stepdad worked with Steve Parent. I read somewhere there is a cia connection with these murders. This is so sad when it happened. Still sad today. To AJ Parent is your grandparents still alive? well he didn’t know them, he knew the temporary care taker/dog sitter on the property and only briefly giving him a ride weeks earlier. It was simply really really wrong place wrong time………………coulda shoulda woulda, but if he had skipped the beer, he might have gotten away in the nick of time. Was William Garretson, the caretaker, considered a friend of Roman and Sharon? I have been curious about that, and have not found any info on it anywhere? I certainly would hope so! Such a sad situation. This young man had his entire life ahead of him! Just makes me so sad! I wonder who the writer and editor are? So many articles here with endless misspelled words and sentences that make absolutely no sense. Please hire some new editors and a spell checker too. I was just thinking the very same thing! I don’t know what you’re talking about. I don’t see any misspelled words or any sentences that don’t make sense. Envelopes should be spelled as envelops. Okay, but that one error hardly justifies saying that the entire article has “endless misspelled words and sentences that make absolutely no sense”. Amazing, some little trivial thing happens and it leads to something like what happened to Parent. If he leaves a minute sooner maybe he’s still alive today. Life can be such a sick joke sometimes. Was William Garretson, the caretaker, considered a friend of Roman and Sharon? I have been curious about that, and have not found any info on it anywhere?? I kind of doubt that, because Bill Vega is not gay, and probably would not have been friends with Steve, if he thought Steve was gay. Bill lived in El Monte at that time, and still lived in El Monte when I met him many years ago, but then moved to another city, which I won’t mention here. He was living with his sickly parents, and saving money to buy a house. When his mother died of cancer, Bill moved out, and then his father died from whatever. I believe Bill went to school with Steve, but I am not positive. You are absolutely correct, Ron-he. I was not thinking clearly when I made that posting. 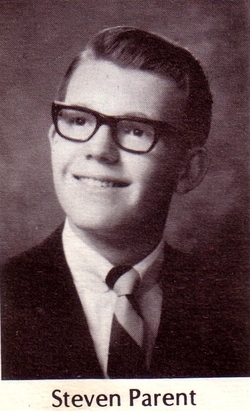 Back then, it was ILLEGAL to be openly gay, so murder victim Steve Parent would definitely NOT be inclined to talk about it, if he was indeed gay, which he surely could have been. Thank You for bringing this to my attention. Such a tragedy, no matter how you look at it. I cannot comprehend how these families have dealt with, and persevered through all of this. Sobering to realize that in a split second, your life, and those of your families and friends can be irrevocably changed forever, and you find yourself on a path that you never would have chosen. Was William Garretson, the caretaker, considered a friend of Roman and Sharon? I have been curious about that, and have not found any info on it anywhere. “members of his LSD-crazed ‘family. '” No one doing the murders was on LSD. Everyone was straight. Where did LSD-crazed “family.” come from? Sharon went home because she wanted to have her baby in America. Roman and a friend tried to get her to stay.